Feng Shui Tip: To activate good ch’i (energy) and to help bring in new opportunities and abundance, hang a crystal sun catcher in a window near your front door. View all of our sun catchers here, we have over 50 styles to choose from! 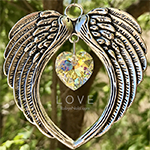 http://www.robynnola.com/product-category/suncatchers/ These brilliant works of art will add color and positive energy to your sacred space. You can hang these crystal sun catchers near a window and they will create wonderful reflections of rainbow colored lights that sparkle and dance about the room. Rainbows are reminders of hope and joy. The crystal sun catcher featured in this photo is called Moon and Star Love, it is one of our latest additions to our sun catcher gallery. 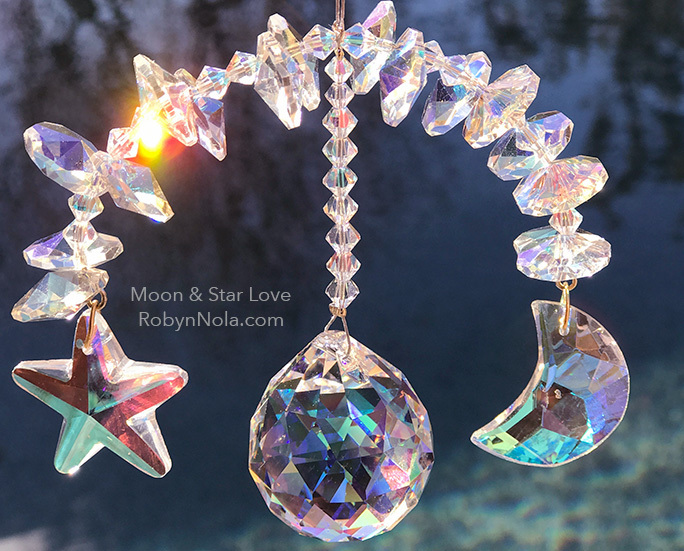 This aurora borealis moon and star crystal sun catcher is stunning. When the sunlight hits it creates magical rainbows. This crystal coloring is called Aurora Borealis because they produce shimmering colors similar to the Northern Lights of the same name. We offer free shipping on all orders in the U.S.